I shot this iridescent insect in my garden recently and really didn’t know what it is until I looked it up online. 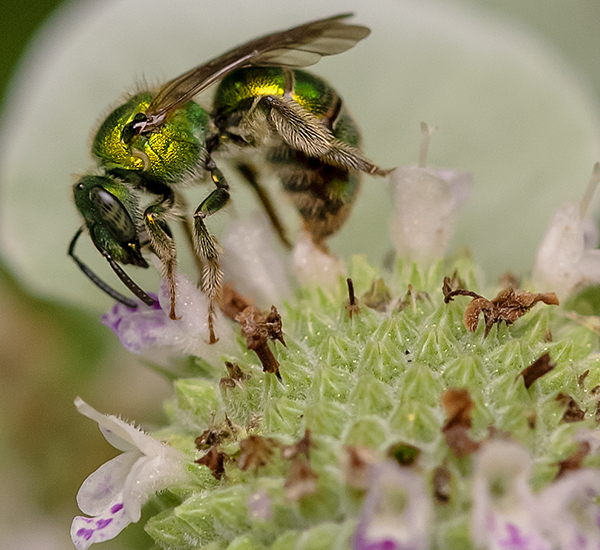 My belief is that it’s an Augochlora Sweat Bee and I will gladly defer to any entomologists out there who can either confirm or correct my thought. If it is indeed a Sweat Bee it gets it’s name, according to what I found, because it likes to lick sweat off of arms or legs. The web passage goes on to assure me that they are fairly passive and “unlikely” to sting. This was not tested as, thankfully, the bee made no attempt to ingest my sweat. I love what can be learned online and that by photographing an insect I have seen often in the garden I learned more about it. This entry was posted in insects, Macro, Summer 2018.